Just when you think that Google is taking over the world in ICT and smart technological innovations, another forgotten brand just prop their head and scream- HELL NO, We're still here! This time, it is Intel that's screaming...we aren't dead yet! Now, according to the guys at pcmag.com, wireless charging has been a dream for years, hampered by the fact that basically nobody has wireless charging pads, never mind the perpetual flurry of press releases that they're coming soon. Add 20-watt magnetic resonance charging to your wireless charging dreams. At IFA here, Intel showed the fruit of its partnership with WiTricity. 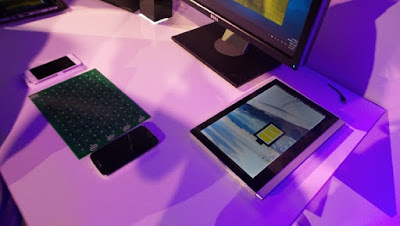 By late 2016, you'll be able to accessorize existing Windows 10-based 2-in-1 computers with wireless charging keyboards, Intel client computing GM Kirk Skaugen said. Just snap off your existing keyboard, and snap a wireless charging one on. Easy. Intel is doing pilot projects with Hilton, Marriott, Emirates Airlines, Land Rover, and the San Francisco airport, Skaugen said, and Intel's magnetic resonance charging technology can work through wood or Corian countertops. I saw it working here at IFA, and it was compelling: it provided enough power for a laptop, and you could slide smartphones around on a magnetic resonance table and they would keep charging. It's a lot more flexible, both in device positioning and in power levels, than the inductive charging we currently see in phones like the Samsung Galaxy S6. Unfortunately, Intel's solution doesn't solve the confusion in the wireless charging world. The most common wireless charging standard on smartphones right now is Qi, a completely incompatible inductive charging solution. Intel's magnetic resonance is supported by an organization called A4WP, while Qi is under the banner of the WPC. (A third group, the PMA, merged with the A4WP this summer. Android Authority has a good rundown of the current total mess. As always, the wireless charging question comes down to whether the industry will settle on a single standard and actually implement it. If Qi continues to lead in phones, and magnetic resonance becomes the standard for laptops, hotels and countertop makers will still hold back, because they won't know which one to use. This is what I call flashy technology, and I LOVE IT!